There are a couple movie scenes that scarred me as a child. One happened when I was eight and I will write about it some other time. There was another scene that took place the summer of 1984. A lot of amazing films were released that year, and you might even be going through the list right now to figure it out: Ghostbusters, Gremlins, Temple of Doom, Karate Kid. I was 10 at the time, so we’re going to steer clear of R-rated films (so no Terminator or A Nightmare on Elm Street). It was just one moment in a smaller film attempting to convey huge, galaxy-spanning conquest in the space opera The Last Starfighter. 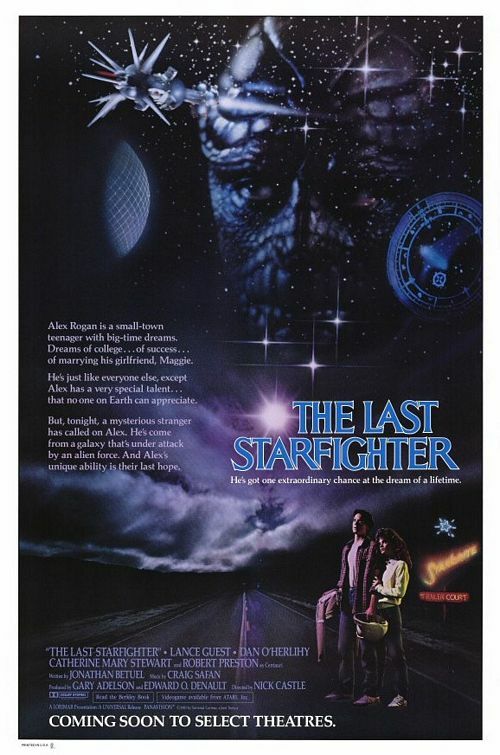 Theatrical teaser poster for The Last Starfighter. The Last Starfighter follows the hero’s journey almost religiously. Alex Rogan (our reluctant hero) lives in a trailer park where he helps people out by doing odd jobs for others. In his downtime, he plays an arcade game coincidentally called Starfighter, and when he breaks the high score the residents of the park rally around him. Unbeknownst to him, beating the game sends out a signal to the Rylan Star League (cool name) that Earth has a hero to help in their fight against Xur and the Ko-Dan Armada. We know they’re the bad guys because the lighting on their ships is much darker and they wear blacks and reds, whereas the Star League is all bright and off-white color schemes. Alex refuses the initial hero’s call and only agrees to help when he finds out he is the last Starfighter that can defend the galaxy. Raise your hands if you spent too many quarters on video games in your childhood. Lance Guest plays the role of Alex with a lot of heart, and he is offset perfectly by Catherine Mary Stewart (who I’ve already waxed poetic on in Night of the Comet) as his girlfriend Maggie who just wants to help him figure out what he wants to do with his life. Robert Preston is in the mentor role as the alien Centauri. Unfortunately, this was Preston’s last film role, but he exudes the charm that made him a hit in The Music Man. Along for the ride as Alex’s biggest ally is another alien named Grig, played by Dan O’Herlihy. You might recognize O’Herlihy out of makeup as the Old Man from Robocop, or even better as Andrew Packard from Twin Peaks. He had a long, incredibly fruitful career and always stood out in his work. Now to get back to that life-changing scene I mentioned. During the initial hero’s call, Alex is replaced on Earth by an android simulant. This android takes on Alex’s features and memories, but while it’s acclimating to his DNA, it hides out in Alex’s bedroom. The moment that scarred me is when the camera shows Beta Alex mid-transformation. He’s slimy and looks like a skinned human being with eyes that are bugging out. When you’re 10, this image is as real as it gets. Not expecting to see something so disgusting and realistic in a random sci-fi film can shock you immensely. I was equally scared, excited, and curious. It’s one moment that lasts for only a couple seconds, but being scared made me want to confront that fear and I started looking for special-effects magazines to figure out how things were created (cheap plug for the old Starlog publications). Not nearly as scary now, but the memories are still haunting. One of the other interesting things about this film is that it was one of the first films to use CGI for its special effects and not focus on physical effects work. 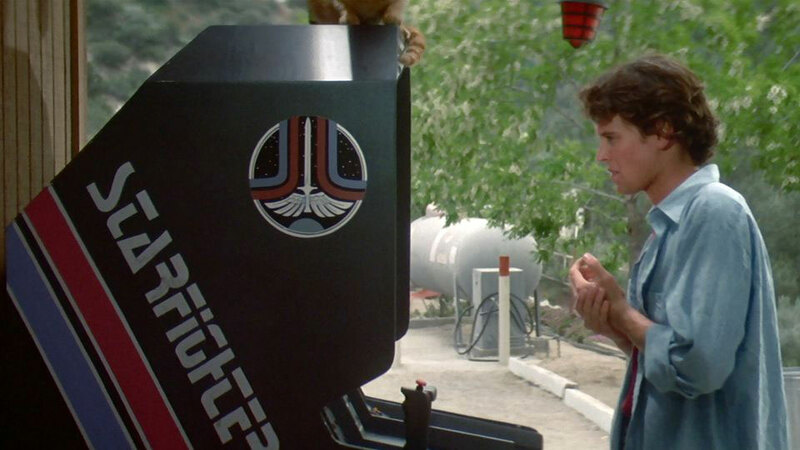 Nowadays, what they accomplished on The Last Starfighter can very easily be done on someone’s home computer, but this was cutting-edge technology at the time. Some of the cuts between the CGI and real film are a little choppy, but it’s admirable in the historical sense. Looks real, doesn’t it? This is the Rylan Star League command base. The Last Starfighter is a fun ride that doesn’t try to break the storytelling mode but has a lead you want to root for, as well as some fun and humorous moments and entertaining make-up effects. The dated CGI will either raise or lower your impression of the film based on how you feel about outdated special effects. Well worth viewing if you’re looking for a diversion into space opera of the ’80s. Why do bad guys always have mood lighting? If they brightened up the ship, maybe they’d be in better moods.